Want to save money on glasses? The clever way to do it is to shop online at retailers like Glasses Direct. They are so popular and when you see how cheap Glasses Direct are, it's easy to see why. With special offers on most of the year round, you'll benefit from heavily discounted spectacles whenever you need them. It's not just Glasses Direct that offer the best online glasses deals, sometimes they pop up at on other sites. Here you can find the best glasses buys at a glance. Who are Glasses Direct? They are an online retailer that set out in 2004 to provide the UK with affordable glasses. As the the UK’s first and leading online prescription glasses retailer, they have the buying power to give the big brands at generous low prices. Did you know that you can get 2 for £19 at Glasses Direct? Yes, TWO pairs of glasses for just £19 with FREE delivery too! To get the 2 for £19 offer from Glasses Direct, simply sign up with your email in the offer box at the top of the homepage. 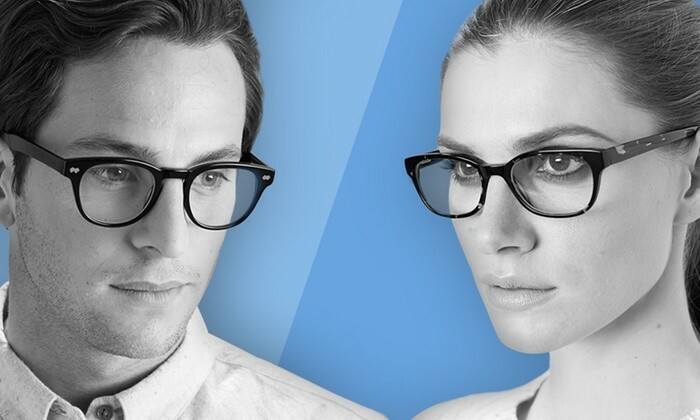 You'll then get £30 off your order, when you select frames priced at £49 two pairs from the "2 for 1" range*. There are some exclusions, and all terms and conditions can be found here*. Glasses Direct always have great offers on, where you can save money, or help others. One popular on going offer at Glasses Direct is "Buy One, Give One"*. This means for every order placed, Glasses Direct will donate a pair of glasses to someone in need. They also offer FREE Home Trial* and FREE Returns* so that you are 100% happy with your glasses purchase. One great way to save money at Glasses Direct is to Refer A Friend*. They get to save £30 off of glasses and you get a FREE £15 Amazon Voucher when they buy. Glasses Direct offer Varifocal Lenses* that are designed to help you focus on things near and far. By using your eyes to look through the top or bottom of the lens, you are able to see clearly no matter where things are. Varifocal Lens start from around £49, and can be fitted to most glasses frames offered on Glasses Direct. Sunglasses* can cost the earth, but Glasses Direct have an impressive range of them. Not only are there many to choose from, but they come in cheaper than if you were to purchase on the high street. Wondering if Glasses Direct are trustworthy? As well as being one of the most popular glasses retailers online, they score a fantastic 9.4 rating on Trustpilot, with over 68,000 reviews. They are a reputable company with qualified opticians and a highly rated customer service team that help with any queries or issue, so you can be reassured that your transaction will go smoothly. What brands do Glasses Direct Sell? Glasses Direct sell popular brands as well as their own range. You can enjoy the likes of Kate Spade, Hugo Boss, Ray-Ban, Marc Jacobs, Jimmy Choo, Dolce and Gabbana and MANY more! Get your Eyes tested at a High Street Optician and obtain an up-to-date prescription. Browse for Frames that take your fancy at online Glasses Retailers like Glasses Direct*, Budgetspex, selectspecs, SpeckyFourEyes, Spex4Less and Glasses2You. Glasses Direct offer a Virtual Try On service, as well as a FREE Seven Day Home Trial. Measure from the centre of one pupil to the centre of the other pupil (in millimetres). Measure the outside of one pupil to the outside of the other pupil (in millimetres). Having trouble getting your Pupil Measurement? You can use a standard ophthalmic measurement of 60mm for Women, and 64mm for Men for Distance Glasses or reduce by 2 millimetres per eye when ordering Near/Reading Glasses. Measure your Eye Size by using the ruler from one end of your eye to the other. Now measure the space between your eyes. You will find Frame Sizes in on the leg of Glasses in three numbers. These tend to be clearly stated in the item description when buying glasses. Single Vision: Designed to help you focus on things that are near, far, or at arm’s length. Bifocals: Designed to help you focus on things that are near and far. The upper part of the lens is for distance and the lower is for near. Varifocals: Designed to help you focus on things everything. Through the top of the lens you can see distance, arm's length through the middle of the lens and through the bottom for near. Specialised Lenses: This could be Sunglasses/Reactive Lenses that give the eyes protection from UVA and UVB rays. For those of you that work with digital devices such as computers, daily, you can get special coatings on the Lenses like Digital Protection BlueReflect (available from Glasses Direct). For stronger prescriptions, you may opt for Thinned Lenses, to give your Glasses a sleeker look. Some online Glasses Retailers will offer a Scratch Resistant option too. Check if the Online Glasses Retailer has a 30-day free returns*period like Glasses Direct does. This gives you peace of mind that they will be right, even after frames they are fitted with your prescription. Feeling better now, about purchasing Glasses online? are the ones you want on here? Vicki Golding my husband used them and was very happy with his two pairs. I had mine from glasses direct. I wanted some raybans and in vision Express they were £240. At glassed direct the same pair were £70. Ok I saved a packet and got the glasses I wanted. But the down side is they aren't checked and fitted to your face properly. I have a lot of trouble with my glasses literally falling off my face.